Das Hostel Rijeka features well equipped rooms with common bathroom, air condition, free wireless locker for each bed, terrace, a luggage storage space, safe deposit box and laundry facilities. All important tourist attractions are just a short drive away. There is a tourist information center nearby so guests can have all information they need. Das Hostel Rijeka is located 4,2 km from the center and all important tourist attractions are located there. The main railway station is also located in the center, such as the main bus station. The famous sanctuary in Trsat is located just a few minutes away from the hostel. Well known pub Beertija is right within the hostel. Payment upon arrival by cash, credit cards (Visa, MasterCard and Maestro). 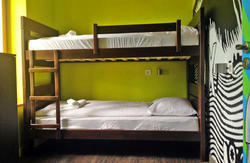 Before you come to our hostel, please contact staff in Beertija pub to help you with your accommodation and stay. We are located 4,2 km from the center of Rijeka. The easiest way to find is to use the bus nr. 2 SrdoÄi-Trsat. We are just a few minutes walking from the bus station. If you are comming by bus or train, you can also take the bus nr.2. Airport is located in the Island of Krk.